Dry aged steak was something I would only get right after payday, and when I was feeling particularly celebratory, otherwise the cost of getting such a delicious meal would always force me to flip back to the cheaper side of the menu. Thus you could probably imagine my excitement to discover that there was an easy way to dry age steak at home, bringing one of my favourite meals right to my kitchen. Introducing the SteakAger! This amazing device comes in the simple form of a white box, but will quickly become a staple for steak fans everywhere! Its compact design simulates the environment of a professional dry-aging fridge, without taking up precious kitchen space. Dry aged beef is noticeably more tender and richer in flavour than your standard steak. The process includes storing a primal cut of beef in a cool, humidity controlled space for at least 21 days, but can really be dry aged to whatever date after that. 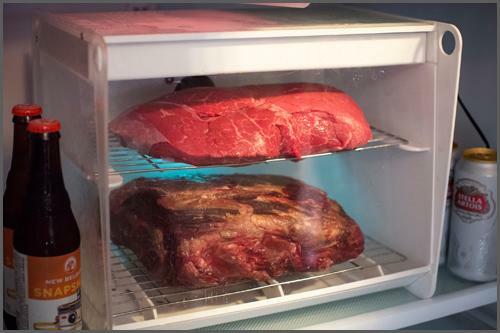 To start the dry aging process, simply place the SteakAger in your fridge and plug it in to create the perfect environment to dry age steak. Inside, a circulating fan aids the drying process, while a germicidal UVC lamp ensures your beef is kept safe. The humidity inside of the SteakAger is controlled by a humidistat and exhaust fan, with an activated carbon fiber filter keeps smells out of your fridge. The LED readout on the top lets you monitor the humidity and temperature inside, while also telling you how long your beef has been aging for.The SteakAger holds up to 22lbs of beef, and though you can put any size of meat inside, it’s best to remember that during the drying process, a cut of beef can lose up to 30% of its moisture. You will also need to carve the outside layer of the beef off, thus losing more meat. For those who have never had the chance to try dry aged steak, OLM asked SteakAger’s resident chef Eric and his team some quick questions about the dry-aging process with the SteakAger. Ottawa Life Magazine: For people who have never tried dry-aged beef before, how would you describe the process of dry-aging beef, and the taste difference between dry-aged beef and a regular cut? Dry aging beef is a centuries old process wherein beef is held in a climate controlled environment. In The Steakager, temperature is maintained at food safe levels and the humidity and moisture are whisked away from the beef allowing for the concentration of beef flavor and an enzymatic breakdown of muscle fibers resulting in an increase in tenderization. Ottawa Life Magazine: What cuts of beef do you recommend for using in the SteakAger? The most commonly used cuts of beef for dry aging are large "sub primal" cuts of Ribeye, New York Strip, and Tenderloin. These large cuts are required to withstand the length of time needed to allow the process to happen gently and slowly. Individual steaks cannot be dry aged. Ottawa Life Magazine: In your opinion, how many days does it take to make the perfect dry aged steak? While each cut is different depending on size and mass, if they are bone in or boneless, and the amount of fat cap present, the dry aging process happens over a minimum of 21 days and most users of The Steakager go up to , but are not limited to 60 plus days depending on their own personal flavor profile. This Chef prefers 35-45 days for Ribeye and NY Strip but has done only 15 days for Tenderloin with amazing results. Feeling hungry? You can grab the SteakAger online on their website here! 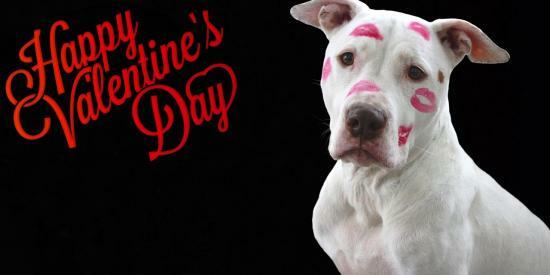 We’ve got a roundup of adorable Valentine’s day gift ideas for your pooch (or a certain dog-loving someone in your life) that’ll be sure to wow them! Paint Your Life connects you with a variety of talented artists who can turn a photo of your pet (or human) into a beautiful work of art.